What a great DVD this is. Johnny Thunders is a legend. By that, I mean that the legend lives beyond his short life. People often speak of him as a legendary figure. To many, though, he wasn’t even heard of before the New York Dolls. Sure, that was a part of his legacy, but it doesn’t define him. Sure, he is legendary, but he was also a man. 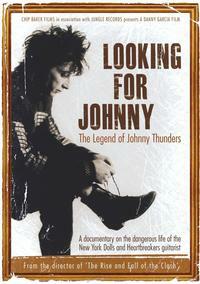 This documentary does a lot to show the man who was Johnny Thunders. It also goes a long way filling the gaps between the rest of his life and The Dolls. If you’ve ever liked the Dolls or Thunders, this is a must have. If you’ve heard about him, but never really knew about him, it’s highly recommended, too. This is a story of a human being. It is a sad story, but one with joy, too. Sure, it’s the story of a men who would become a legend, but ultimately, it is a story of a man. Who can’t appreciate that?